To figure out what type of running shoes you should buy, you first need to know the kind of feet and gait you have. A knowledgeable salesperson at a running specialty store can help you find the right running shoe for your foot type, but you can also figure out what type of foot you have on your own. One way is to just look at your foot. A more accurate method is to examine your footprint by either running in the sand or on paper with wet feet. If you're looking at your foot, you'll know you have flat feet if you don't see any arch. The bottom of your foot, from your toes to your heel, is completely flat. If you do the footprint test, your print will look like a foot-shaped blob. You won't see an inward curve from your big toe to your heel. Problem? If you're flat-footed, you're most likely an overpronator, which means that your feet roll inward when you run. This is not universal, so it still pays to get a gait analysis at a running store to be sure. What to Buy: You will probably need a running shoe that maintains your stability. Look for the words "motion control" and "stability" on the box of running shoes you are considering. In addition to motion-control shoes, some flat-footed runners also need to wear orthotics (custom-made shoe inserts that correct foot issues). You can find running shoe recommendations for male overpronators and for female overpronators. You should be able to easily determine if you have high arches—you'll notice a high and definite arch on your foot. If you do the footprint test, your print will curve inward, making the middle part of your foot look very skinny. When you push your hand against the bottom of your foot, your arch will stay rigid. Problem? If you have high arches, you probably supinate or underpronate, which means your feet roll outwards as you run. It's very important that runners with high arches periodically re-measure their feet because running will cause their arches to gradually fall, making their feet longer. What to Buy: You need to look for flexible running shoes with a soft midsole that absorbs shock. When buying running shoes, look for options with the words "flexible" or "cushioned" included in their descriptions. You can find running shoe recommendations for male underpronators and for female underpronators. If you've examined your foot or your footprint and it doesn't look flat-footed or high-arched, you most likely have a neutral or normal foot. Your footprint will have a noticeable curve inward, but not by more than 3/4 inch. Problem? As long as you pick a running shoe that doesn't counteract your foot type, you shouldn't encounter any problems. This is the most common type of foot, and it's also the least susceptible to injury provided it's outfitted with proper footwear. What to Buy: If you have normal feet, you can choose from a wide variety of running shoes, including ones made for neutral runners or those with slightly flat-footed or high-arched feet. 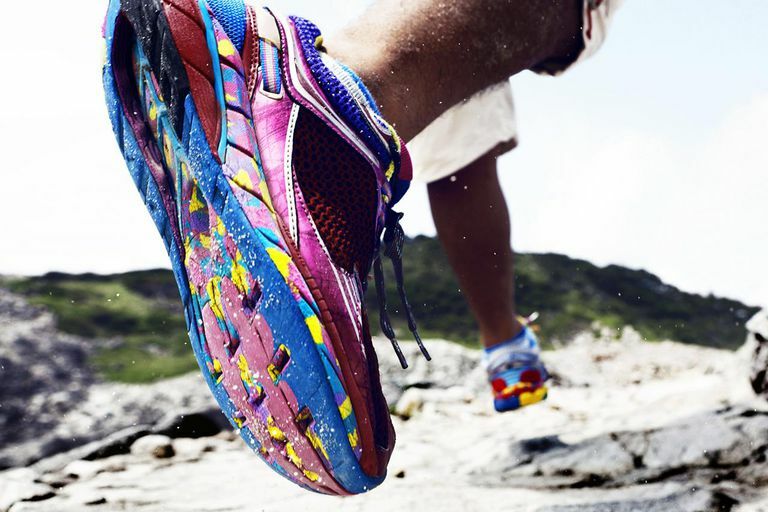 Don't pick running shoes that have a lot of stability or motion control. You can find running Shoe recommendations for male neutral runners and for female neutral runners. For many years you could find running shoes separated into the categories of motion control, stability, cushioned, and neutral. More and more shoe manufacturers, online vendors, and specialty running stores are adopting different categories. Rather than a cushioned shoe category, you may see the level of cushioning rated from 1 to 5. Similarly, the motion control category may be eliminated, but shoes providing motion control are labeled as stability plus or neutral plus. This can be confusing if you've shopped with these categories for years, but they hope to make it less confusing for new runners.